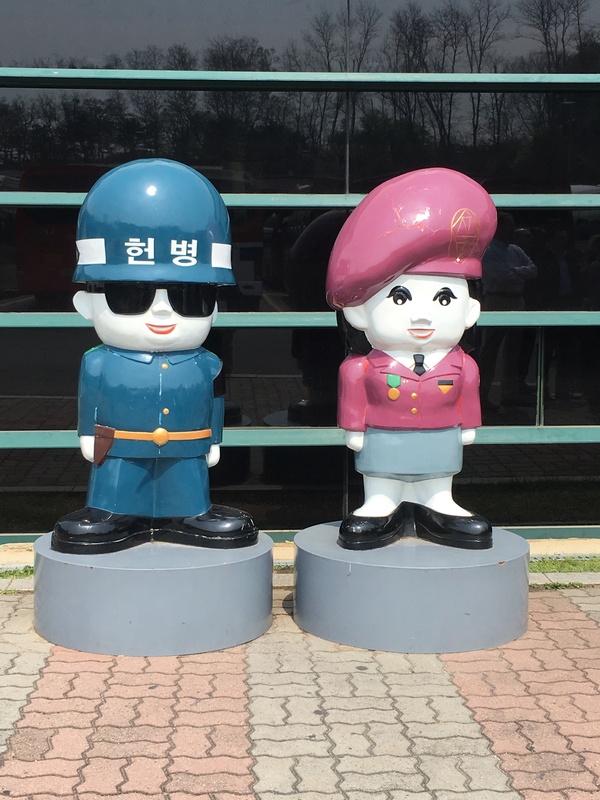 The USO tour I took was the DMZ & JSA tour (Korean Demilitarized Zone and Joint Security Area). You have to sign up for this tour at least 4 days in advance so your passport can be checked and you can be cleared by security to go. You also have to wear this badge. 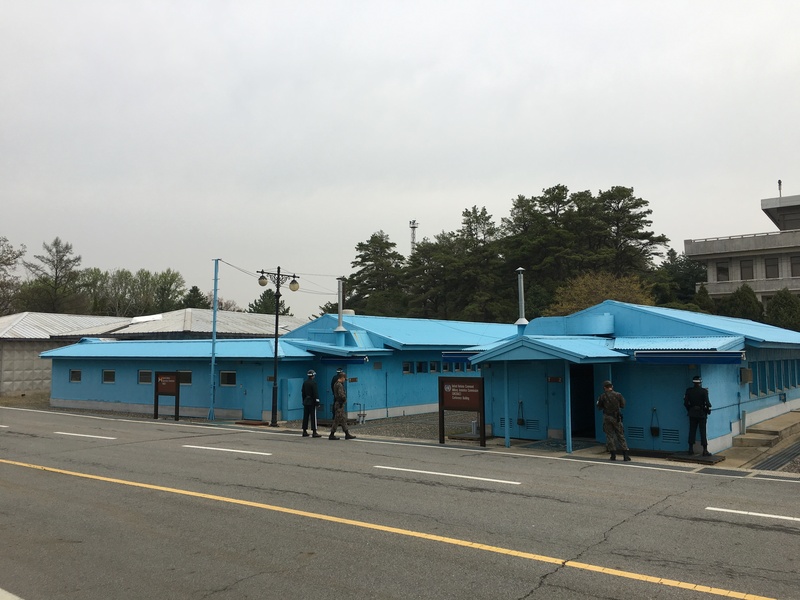 Located in Panmunjom, our first stop was a stop at Camp Bonifas, a former United Nations Command military post, that is about 1/4 mile from the DMZ. 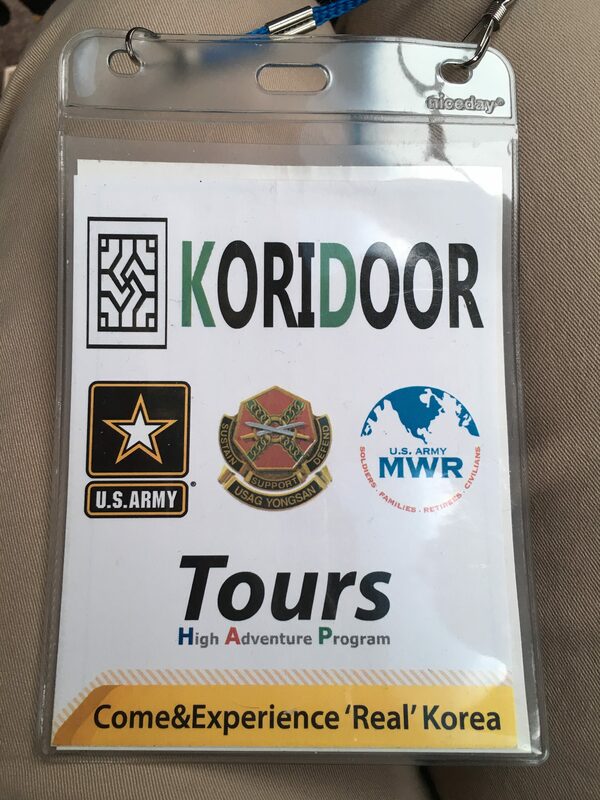 There we were met by our US Army guides who would be with us for the next part of the tour to the Joint Security Area and several other stops. 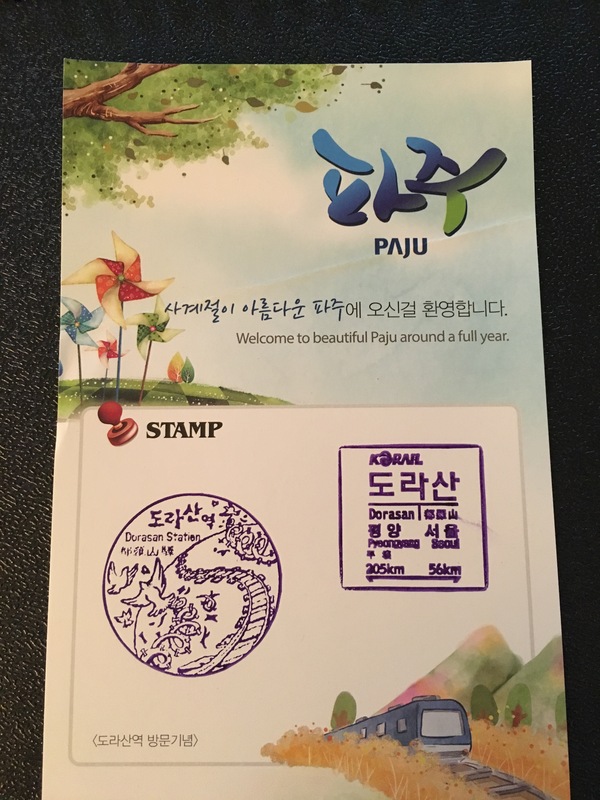 Our Korean tour guide stayed behind for this part of the tour as Korean citizens are not allowed to go beyond this point unless they apply for and receive special permission from their government. 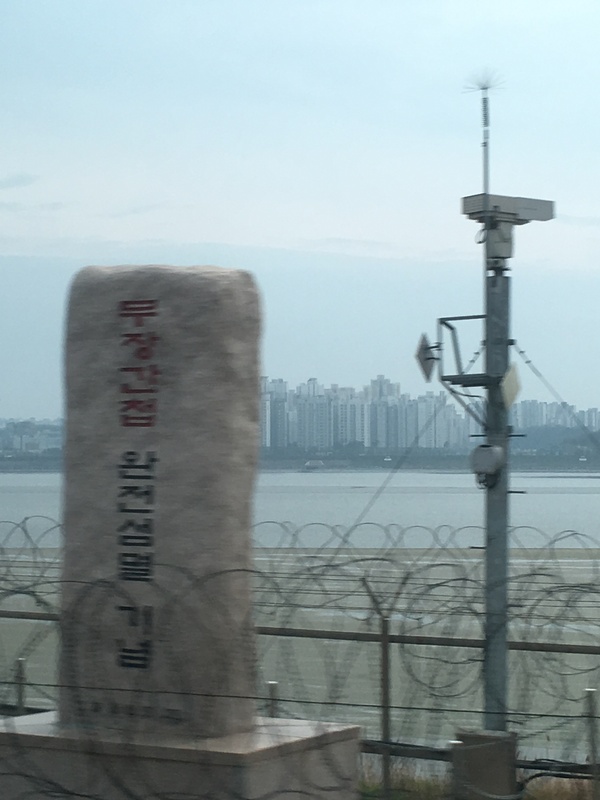 We were instructed to leave everything on the bus except our camera, to make two lines, stay in line and then were walked into a briefing room where we watched a slide show about the history of the JSA (Joint Security Area). Then it was back on the bus and off we went. 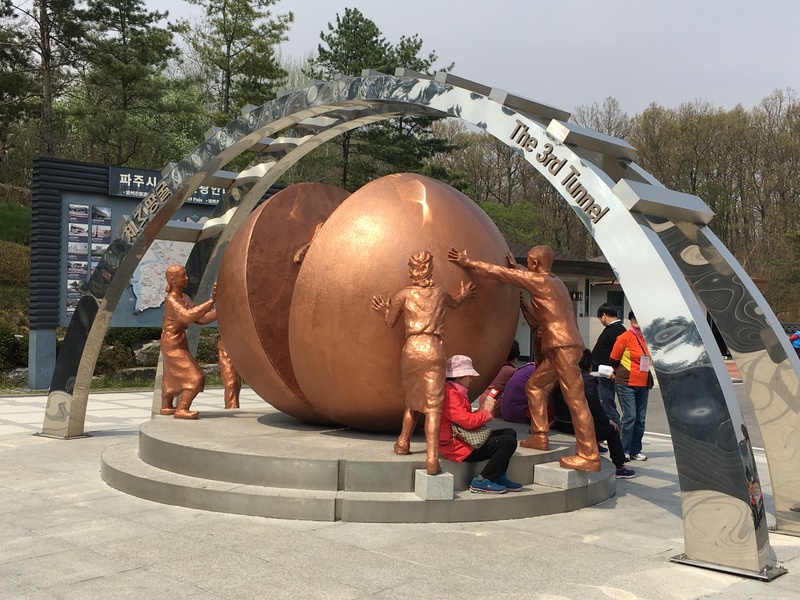 The JSA is the closest point that a tourist can get to North Korea. 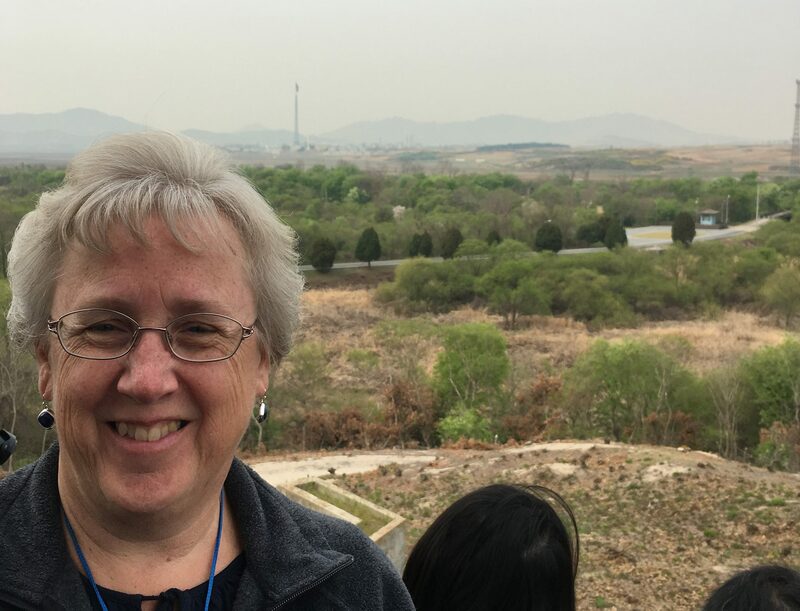 We were again made to stand in two lines and given strict instructions – no picture taking until we were given permission, pictures can only be taken in the direction of North Korea. (in other words, no turning around and taking pictures of the building we came out of), no waving, no pointing. no making faces…in other words behave ourselves. Probably one of the reasons that children age 10 and under are not allowed on the tour. Our group was immediately taken into the blue building on the left in the picture below. These blue buildings are in somewhat of a neutral zone. 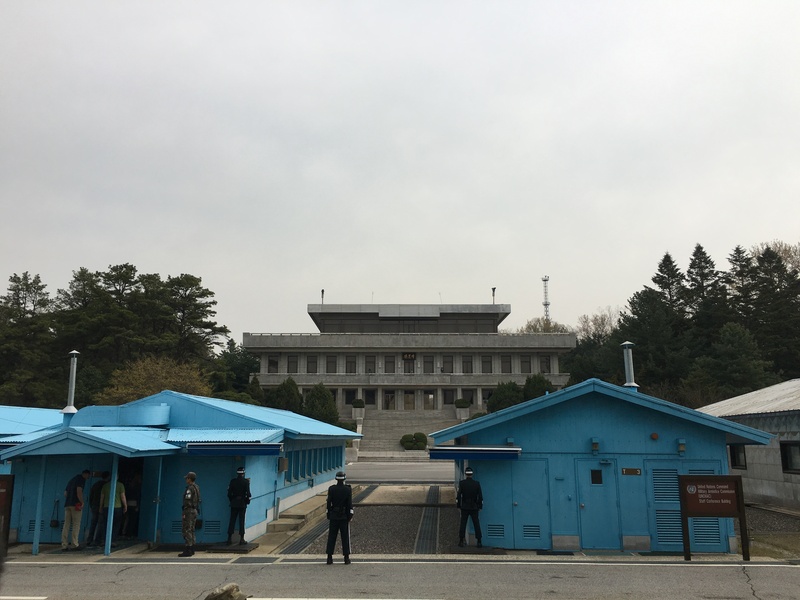 The building on the left is the conference room where the peace talks were held in October of 1951, and then again in July 1953 when the Armistice agreement was signed between North and South Korea. 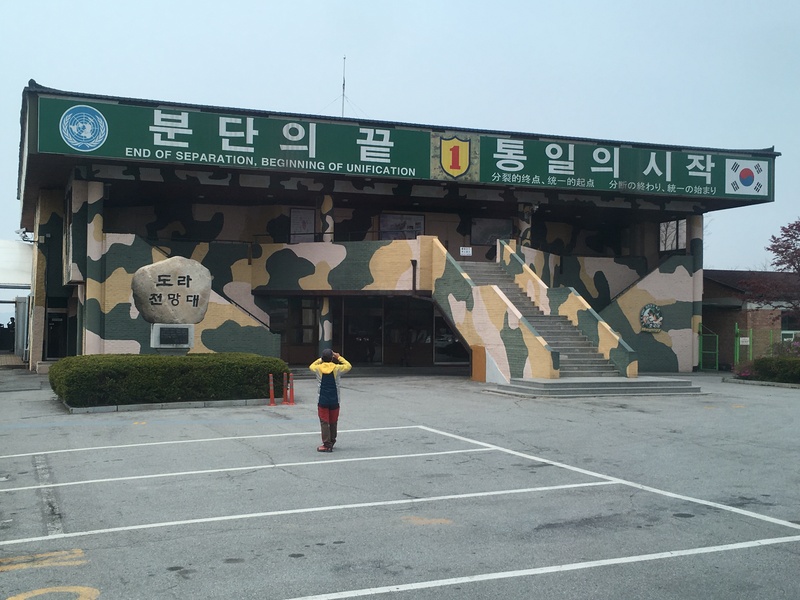 The building sits right on the border of North and South Korea. See in the picture below where there is sand on one side and rocks on the other? That is the MDL (Military Demarcation Line). 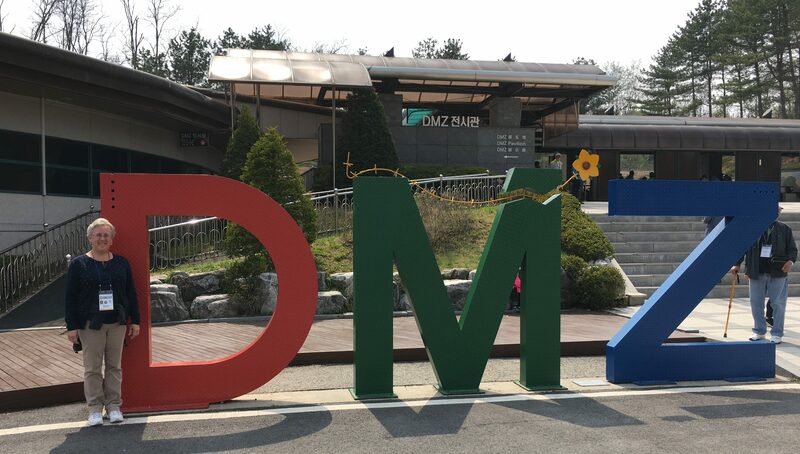 This is not to be confused with the DMZ (Demilitarization Zone. which extends 2 kilometres to the north and 2 kilometres to the south on either side of the MDL. 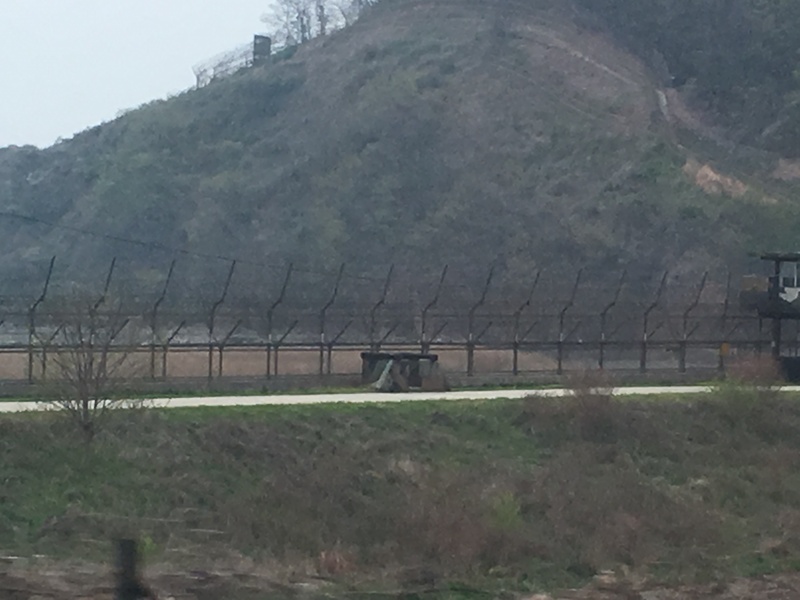 So the DMZ it’s about 2 1/2 miles wide. There are Korean Military guarding the outside of the building. And US Army guards too. 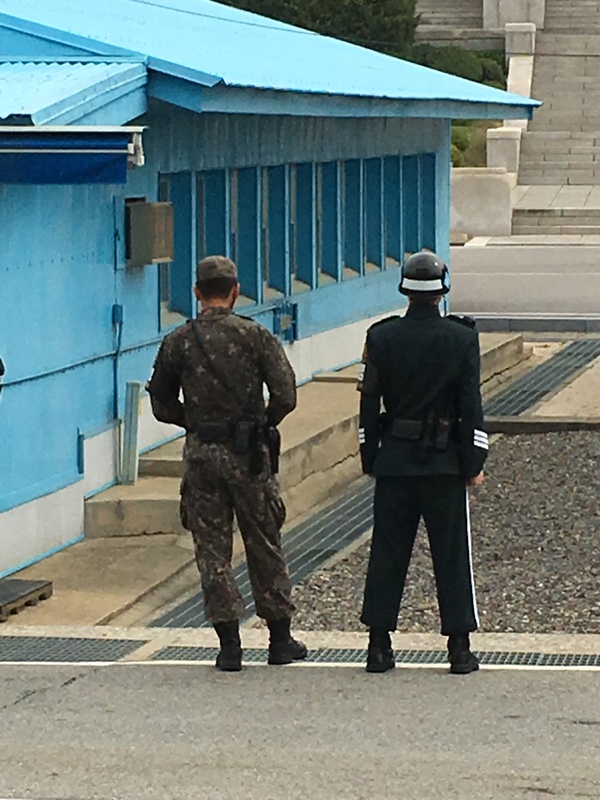 Inside the building, there are Korean soldiers standing guard too. 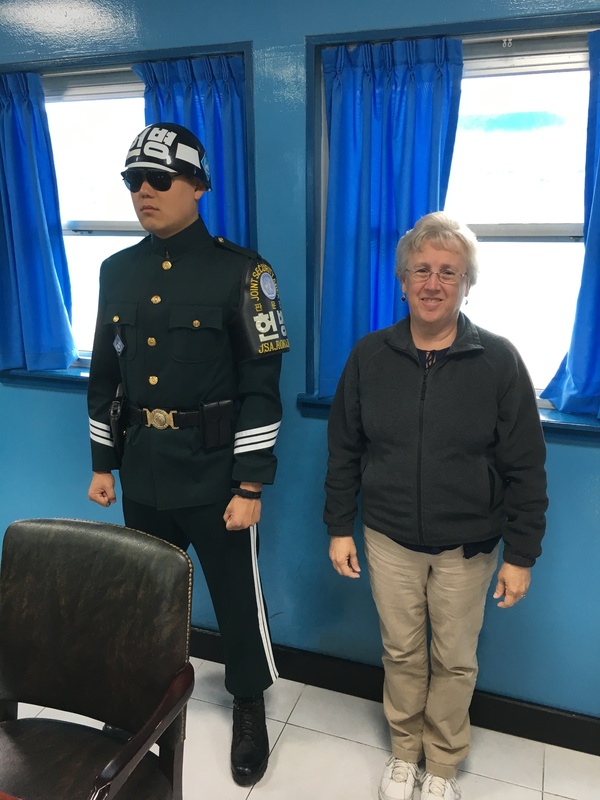 Once we were again instructed on “how” we could take pictures (only pictures facing the direction of North Korea, you can take pictures with the guards, but must stand at least 6″ apart, no taking pictures out the window.) There is a dividing line inside the building too…the conference table is in the middle of the room. 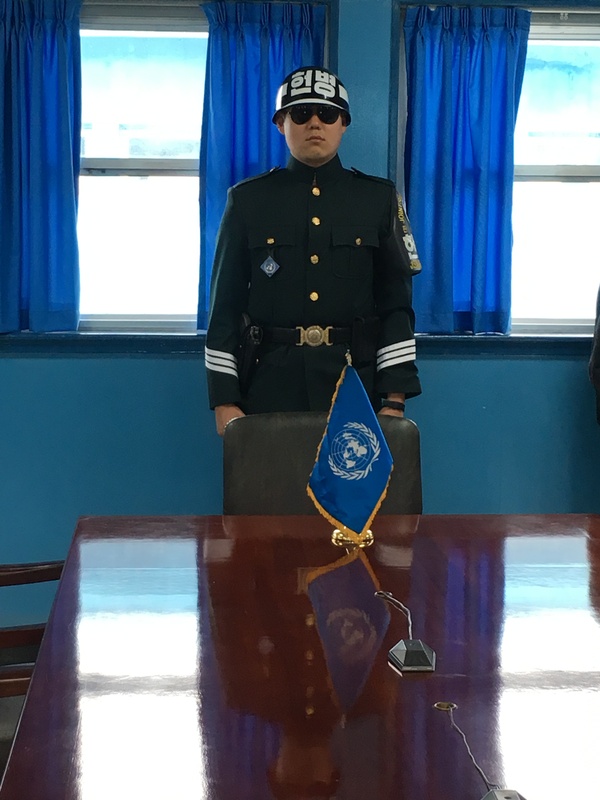 The microphone cord on the table is the line between North and South Korea, so if you are standing on the far side of the table, you are in North Korea. 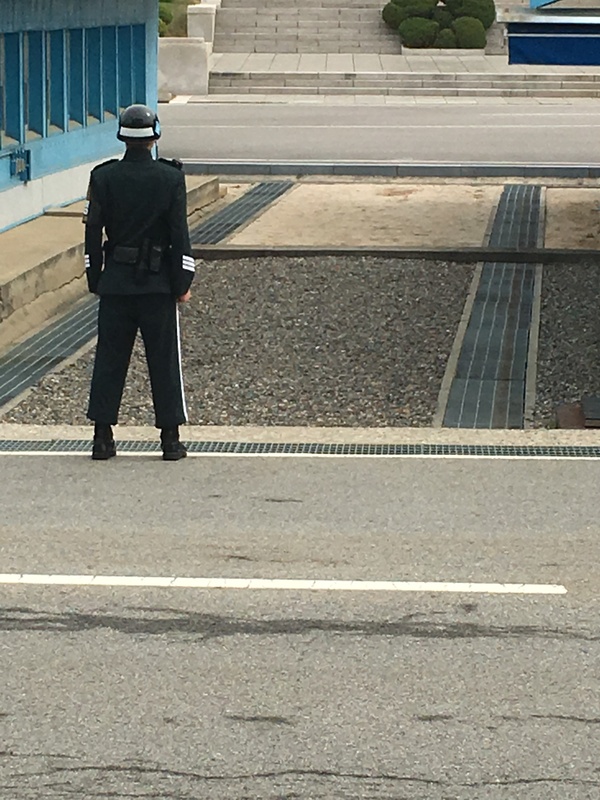 In the picture above when I am standing the South Korean soldier, I was actually standing in North Korea. Proof I was there! The guards are there for your protection. 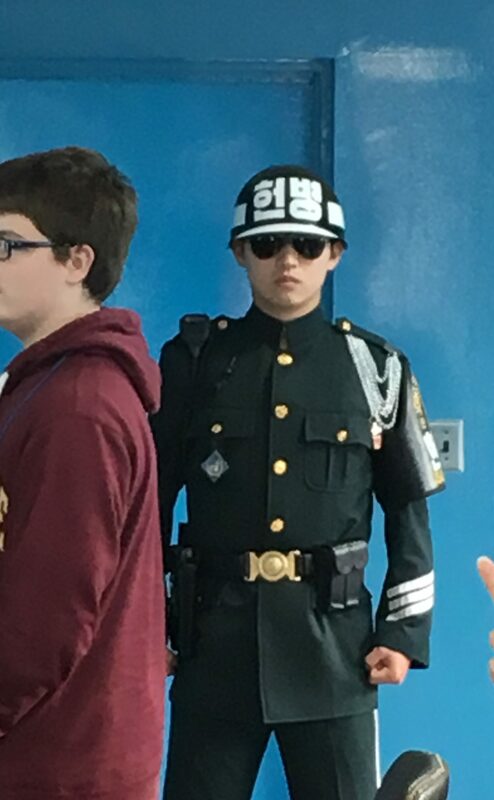 They will protect you in the building and on the South Korean side of the MDL. However if you choose to walk out the door behind this soldier, you will be in North Korea and you are on your own. 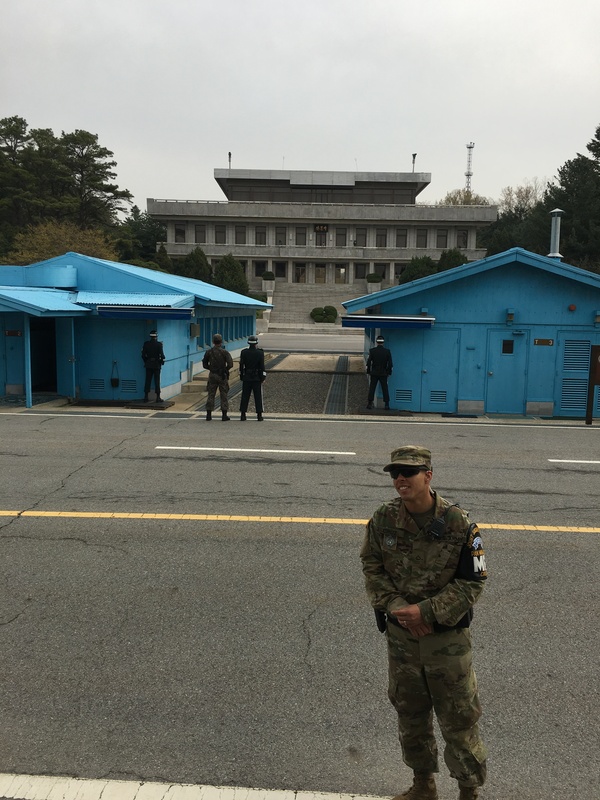 When we came out we were lined up on the steps of the building and were allowed to take pictures….only facing North Korea. This is our military guide watching us to make sure we obey….he also answered questions while the other half of our group was inside the conference room. One in our group thought the instructions did not apply to her. She was pulled aside and her camera was confiscated after she turned around to take pictures of the building behind us. 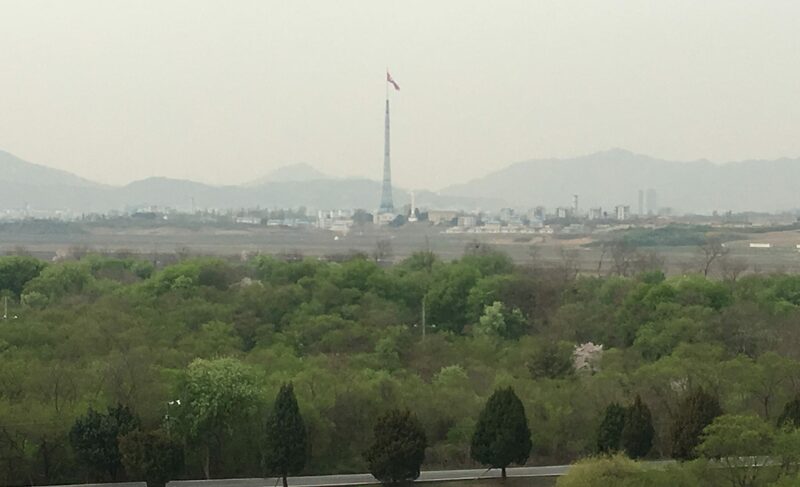 The big gray building in front of us is the North Korean “visitor center”. While we were busy taking pictures, we were also told that they could be taking pictures of us too. They use them for propaganda purposes. There was one North Korean armed guard on the balcony of that building while we were there. The US Military call him “Bob”. He stands at attention 12 hours a day. It’s the same man, Every. single. day. 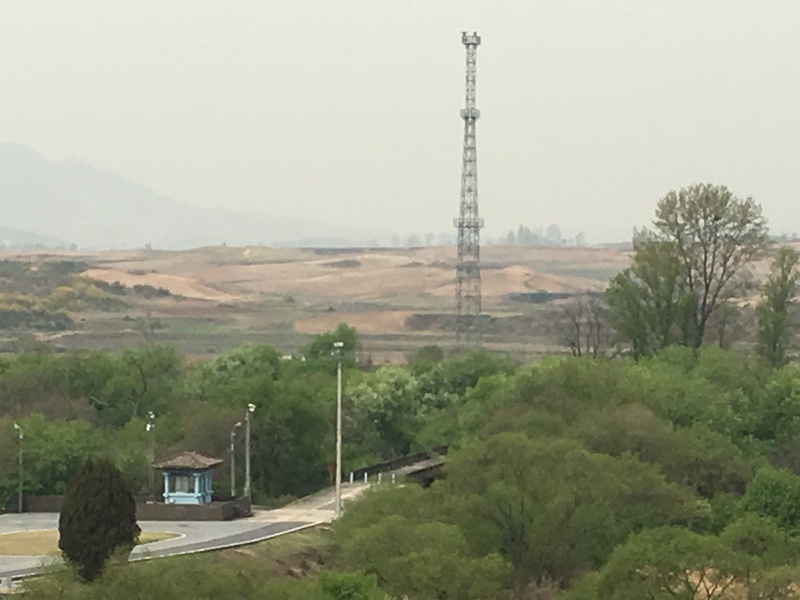 Fun fact: This is the only portion of the Demilitarized Zone (DMZ) where North and South Korean forces stand face-to-face. 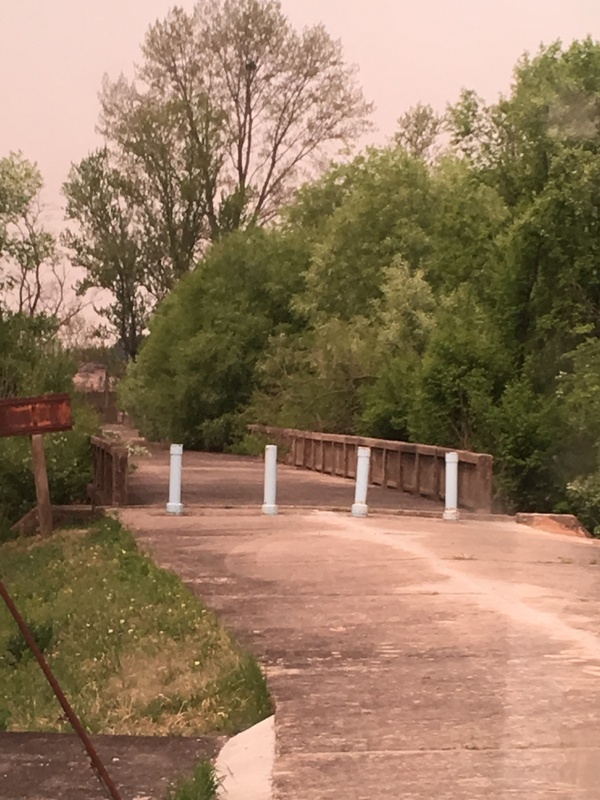 It is called the Bridge of No Return for a reason. This bridge crosses the MDL (Military Demarcation Line) between North Korea and South Korea. 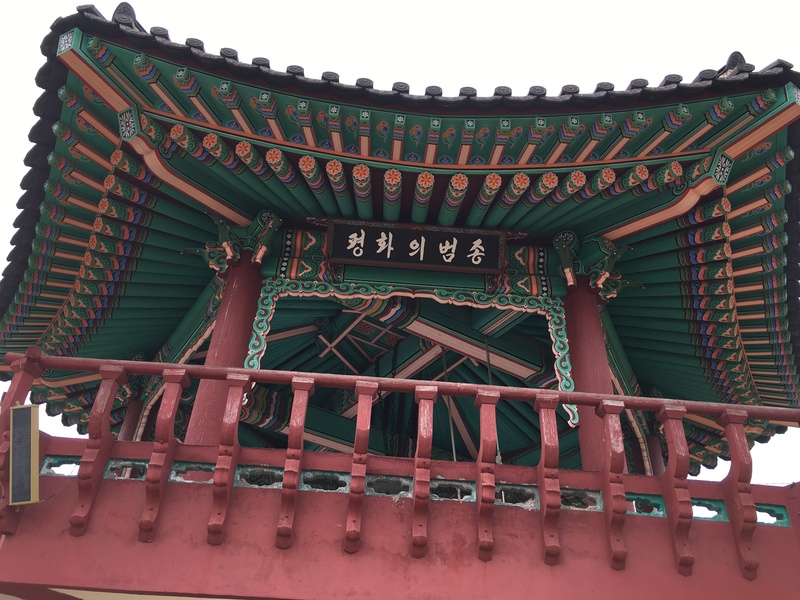 It was used for POW exchanges at the end of the Korean War in 1953. The name comes from the ultimatum that POW’s were given: They could remain in the country where they were captured or they could cross and return to their homeland. However, if they crossed the bridge, they would never be allowed to return, even if they changed their mind later. This is also the sight of the Axe Murder Incident on August 18, 1976. Two US Army officers, Captain Bonifas and Lt. Barrett were ambushed and killed by North Korean soldiers. 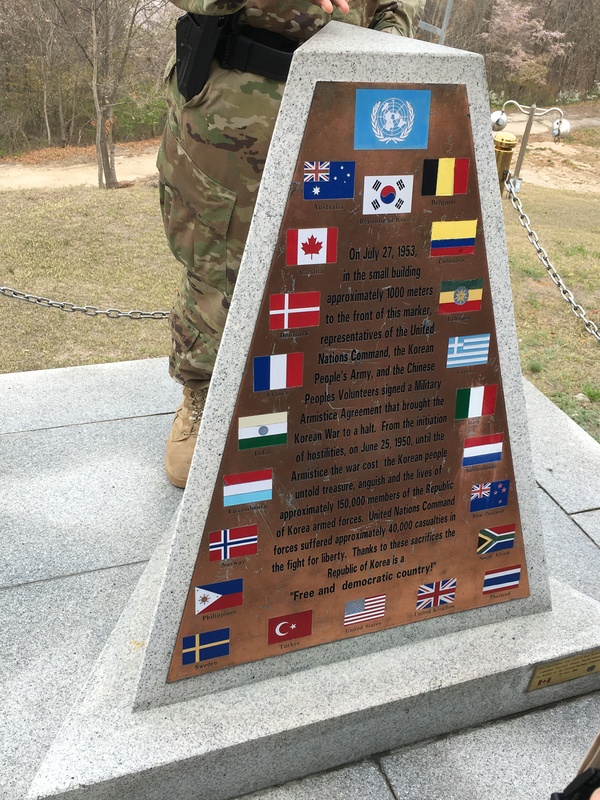 The two officers had been part of a group that attempted to trim a large poplar tree that was blocking the view of United Nations observers to see between two checkpoints. Three days later, the American and Korean forces launched “Operation Paul Bunyan” and cut down the tree completely. 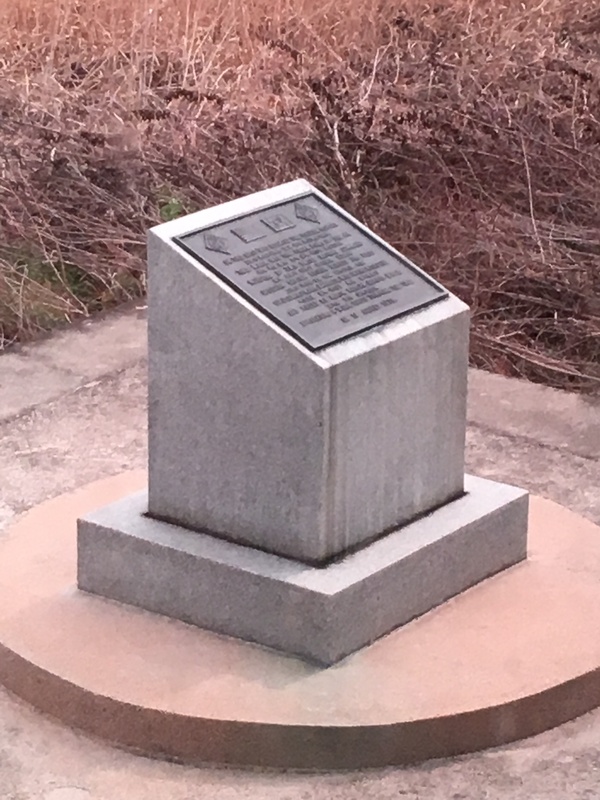 This marker along the road marks the spot where the tree once stood. 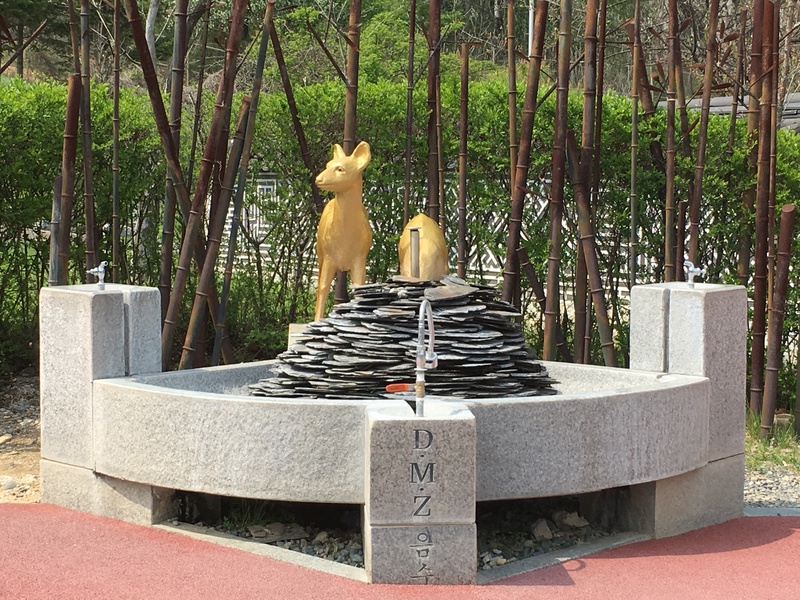 South Korea also has a civilian village, Daeseong-dong, in the DMZ. But there are restrictions to who can live there….you must be a direct descendent of the original landowners or marry into the families. They also have to abide by all South Korean laws, (except you are exempt from mandatory military service)…but you have a nightly curfew. 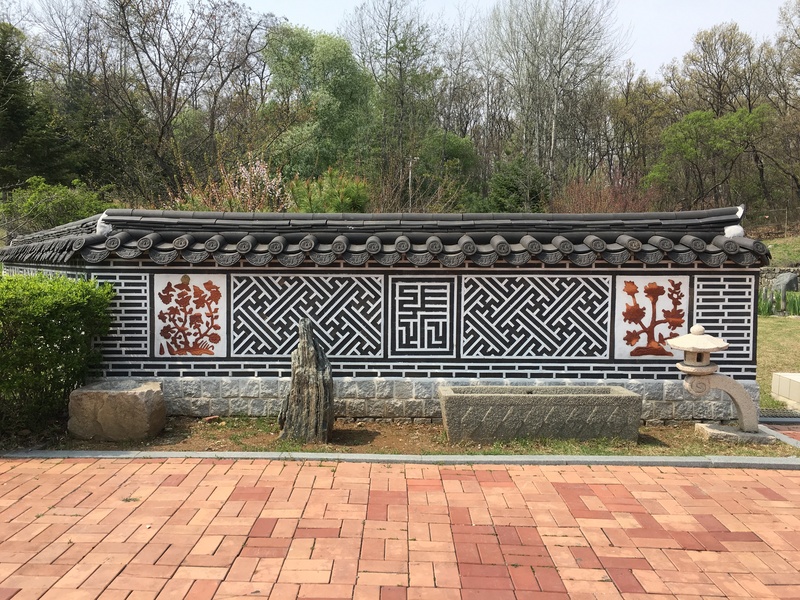 There is a school there for the residents that is supposed to be the best in the South Korea, but it currently has less than 20 students. (All fun facts provided by our US Army guides as we are riding back to meet our Korean guide and continue our trip.). 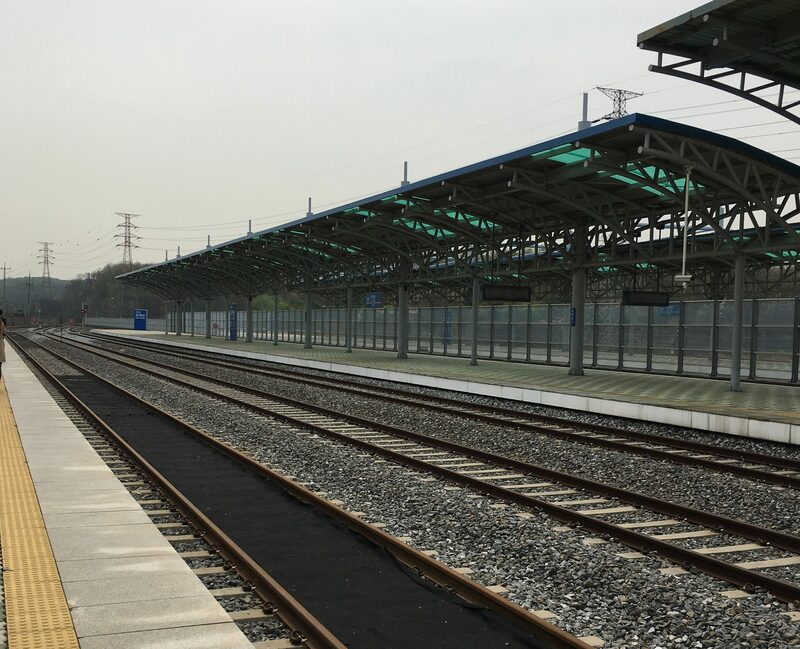 Dorasan Rail Station which was built in 2002 at the cost equivalent of $40 million US dollars is our next stop. 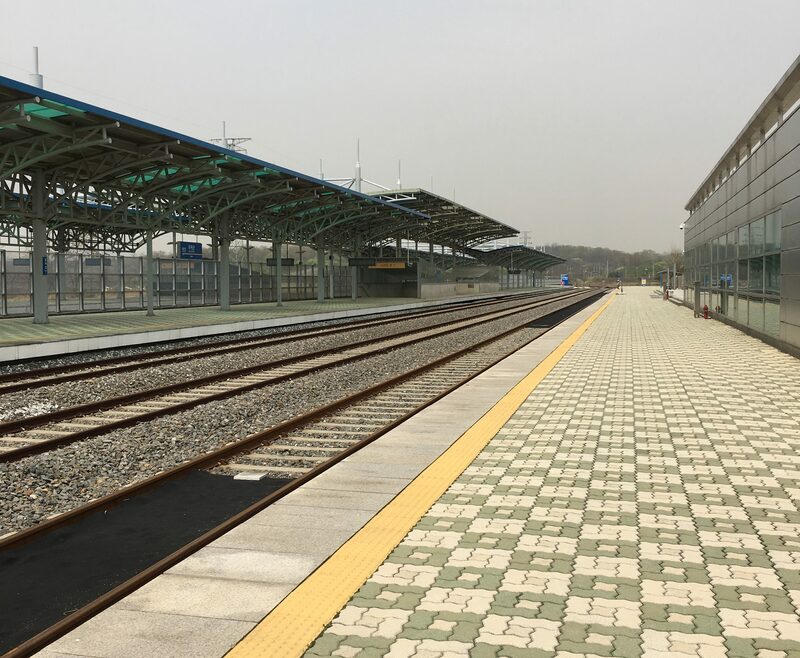 Built in hopes of a re-unification of North and South Korea, the railway station connects North and South Korea. 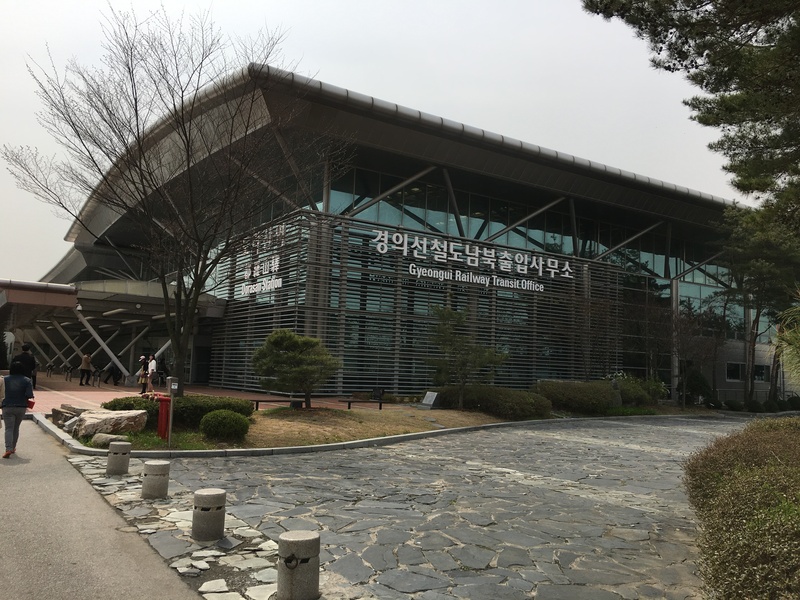 Although North Korea cooperated in building the station, North Korea doesn’t allow trains to pass through, so the building sits unused. 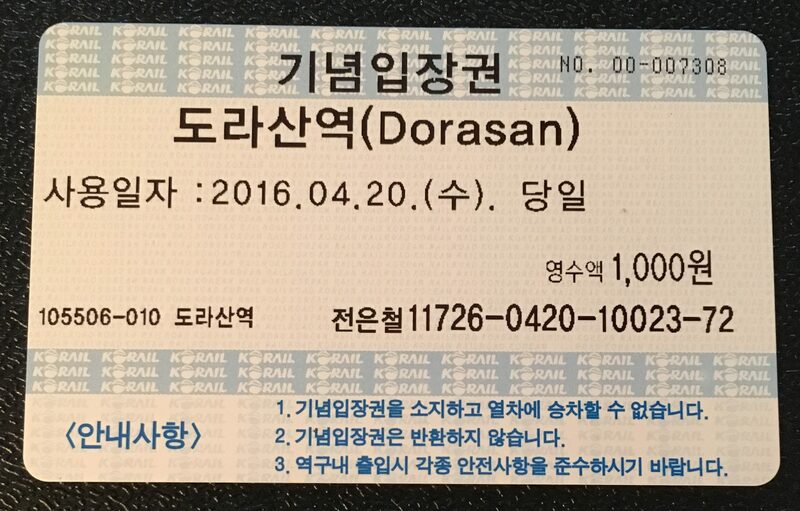 For 1,000 won (about $1) you can buy a train “ticket” that allows you out onto the reunification platform. This is the sign above the entrance to the train platform. They have high hopes that one day re-unification will take place. It’s also evident from this sign display too. 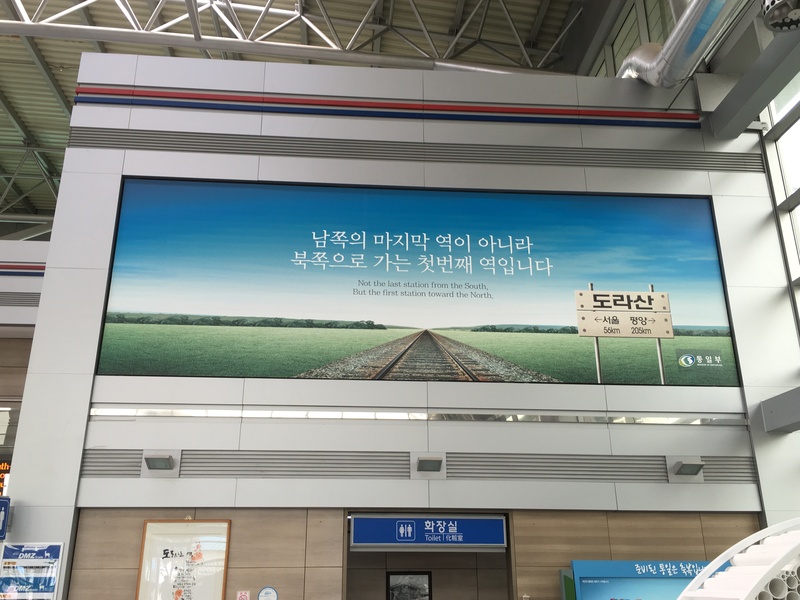 “Not the last station from the South, But the first station toward the North” Once outside, the platform is deserted. 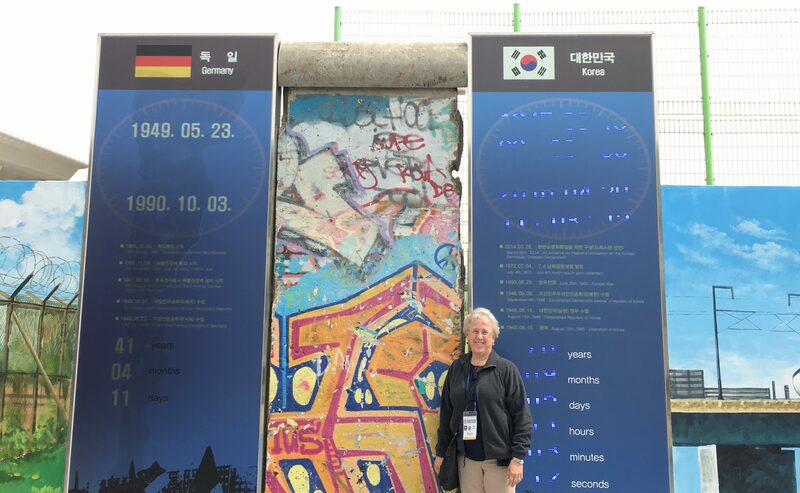 There is a display of a piece of the Berlin Wall that was put up in 2015. 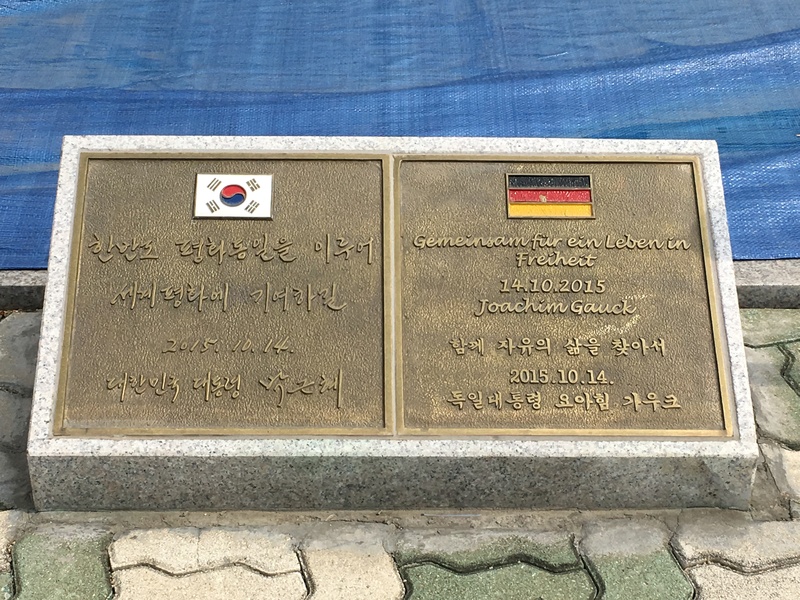 On the left is the time it took to unify Germany, on the right the clock is still ticking on the time it will take to unify Korea. 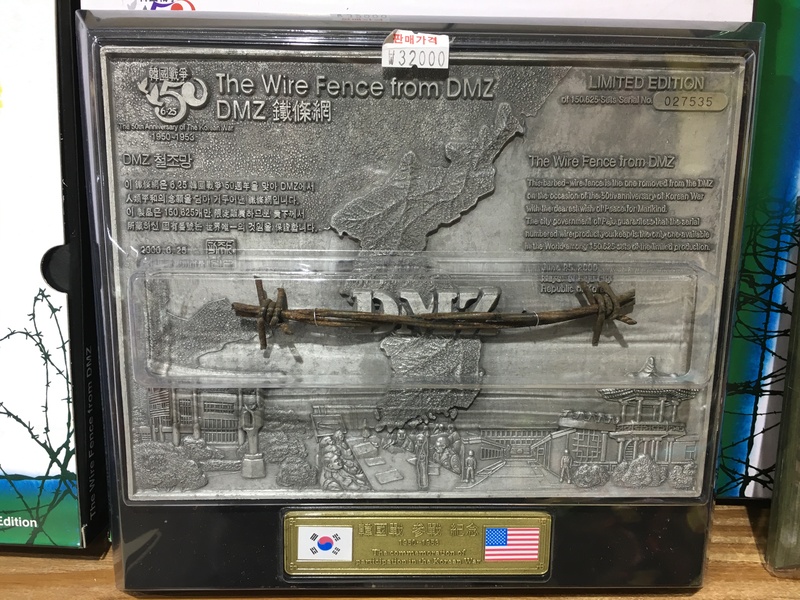 Before you leave the station, be sure to check out the gift shop where you can buy your own piece of the barbed wire that protects the DMZ ….and you can get a passport stamp too….only don’t stamp your real passport! Use the paper they provide. After a quick lunch at a nearby restaurant (think it just caters to the tour buses, because our bus load of people were the only ones there.) 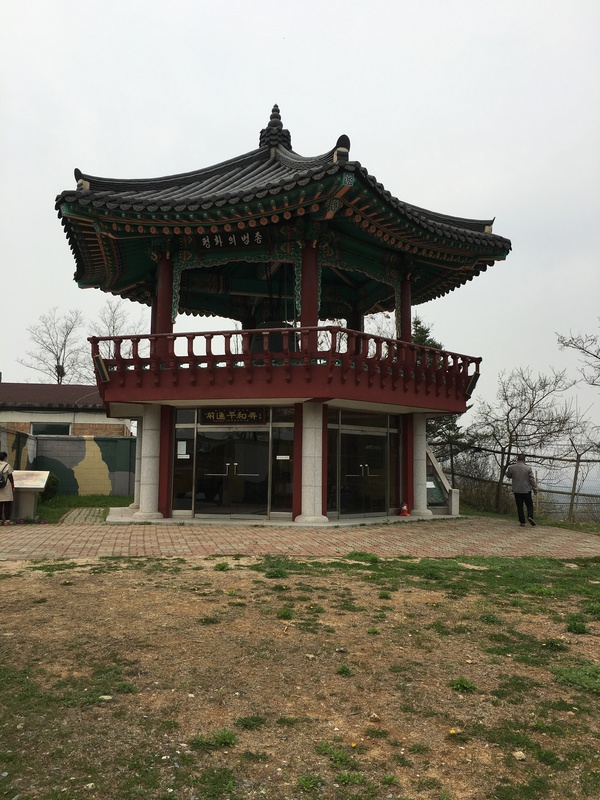 We continued on to the Dorasan Observatory. It was a hazy day, so the views weren’t that good. 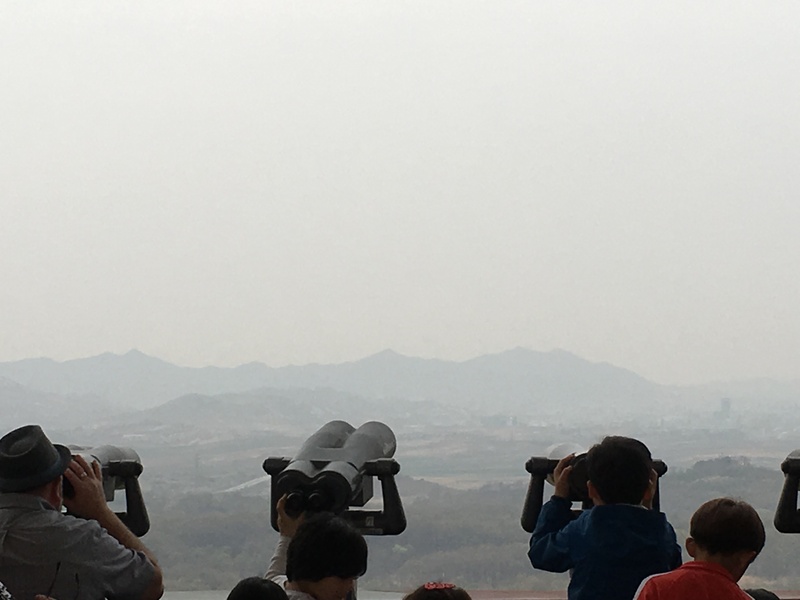 There are free binoculars, but hazy far away and hazy close up still looks the same. 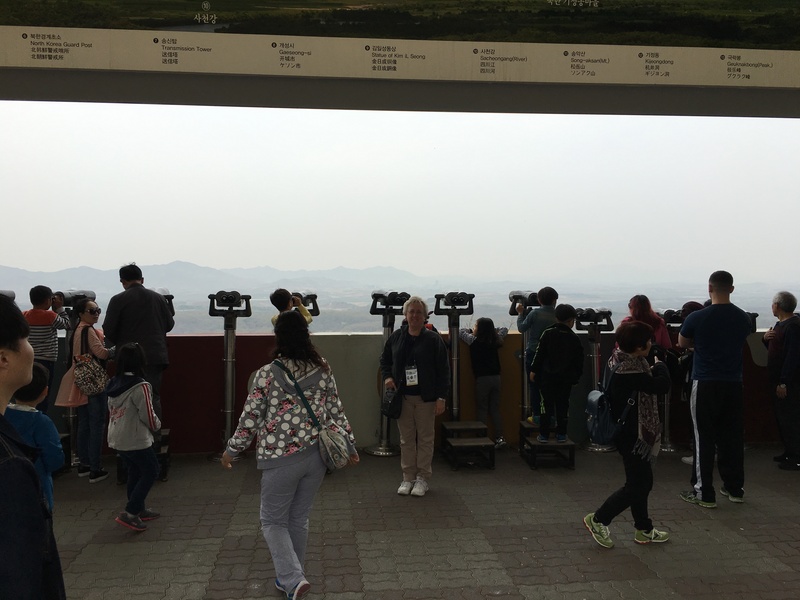 You can take pictures, but not where the binoculars are, but behind a line near the back of the observation deck. 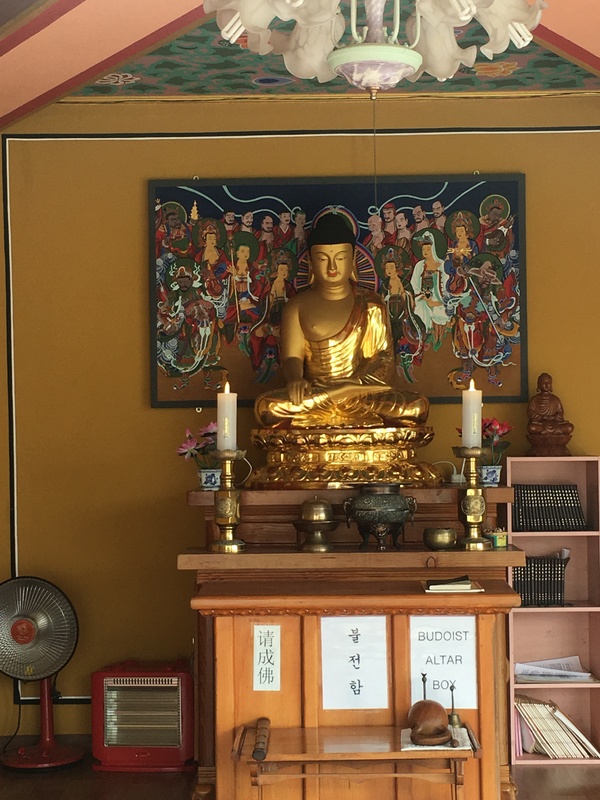 Since the view wasn’t that good, I went over to check out this….yes, it’s a very small Buddhist Temple. 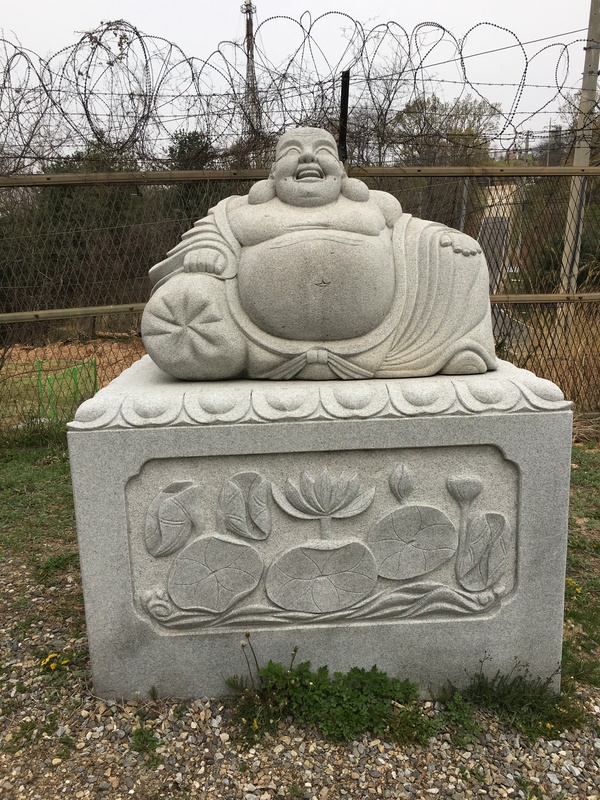 Complete with little Buddha statue too. Our last stop was a visit to the Third Infiltation Tunnel. 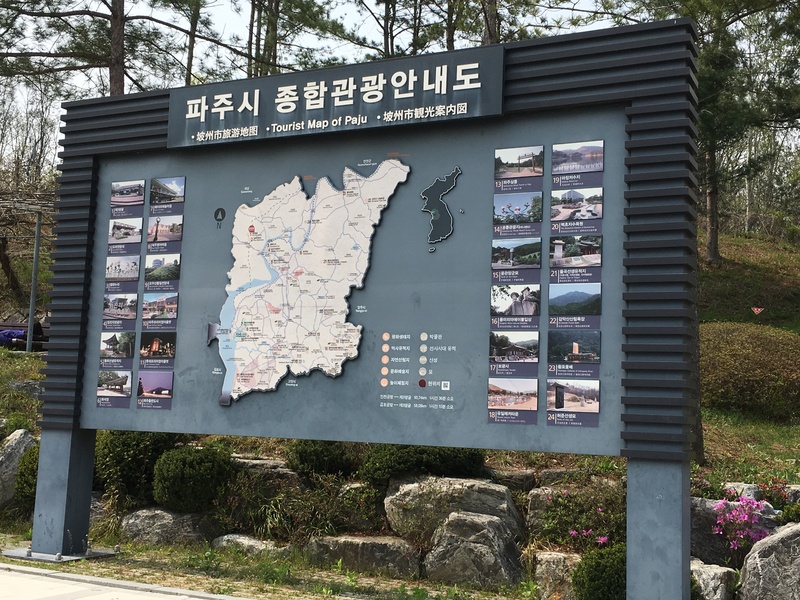 Yes, the North Koreans dug tunnels….going towards Seoul. This is one of four tunnels that have been discovered since 1974, although there are believed to be many more. This tunnel is only 4 km from Panjunmon and is along a direct line to Seoul. It is about a mile long and can accommodate up to 30,000 soldiers per hour! North Korea denied building the tunnel, saying it was a coal mine, and even went to far as to put coal dust on the walls. But the walls are definitely granite. The tunnel has been sealed off by a series of concrete barricades. You can walk into the tunnel…up to where the barricade is. No pictures are allowed…and you must wear a hard hat as the ceilings are low. I’m 5’3″ and with the hard hat on I barely passed underneath and hit my head a few times. It’s a steep walk too….going down at about a 45 degree angle. If you have asthma or heart problems, they do not recommend that you go into the tunnel. Just remember that if you walk down, you must walk up. There is no shame in taking advantage of the few benches on your way back up. I have no shame. I stopped at every bench. Even if you don’t go into the tunnel, there is plenty to see outside, as well as inside a small museum/visitor center. My husband would have stationed himself next to this big map. 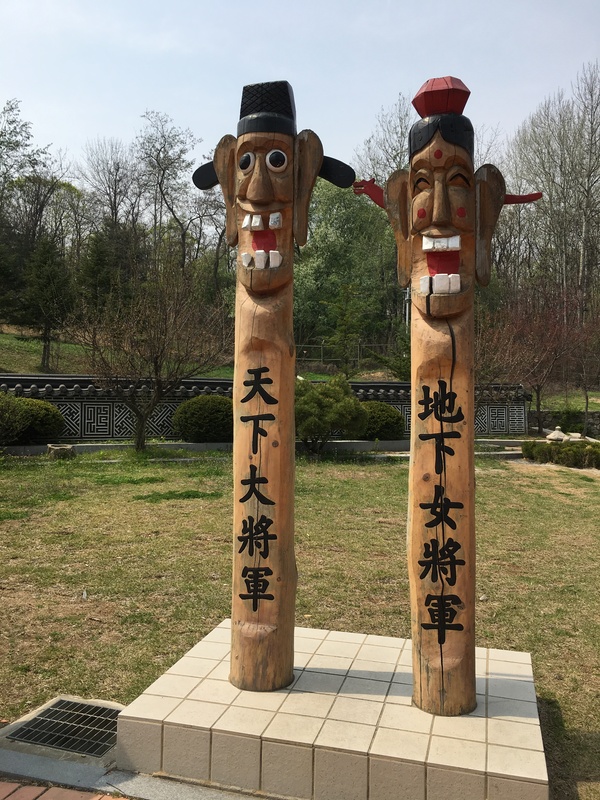 But there is plenty more to see…totem poles, deer statues, a wall and little people. 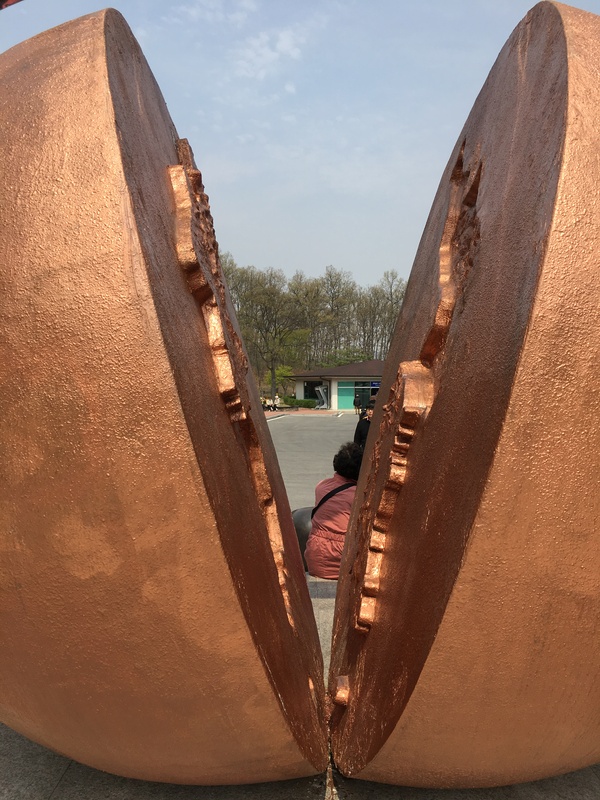 The most interesting though is this sculpture…a reminder that Korea is a split country and the hope that one day the two parts will again be together. Remember that I told you to sit on the right side of the bus? Well, make you sure do that on the ride back to Seoul. 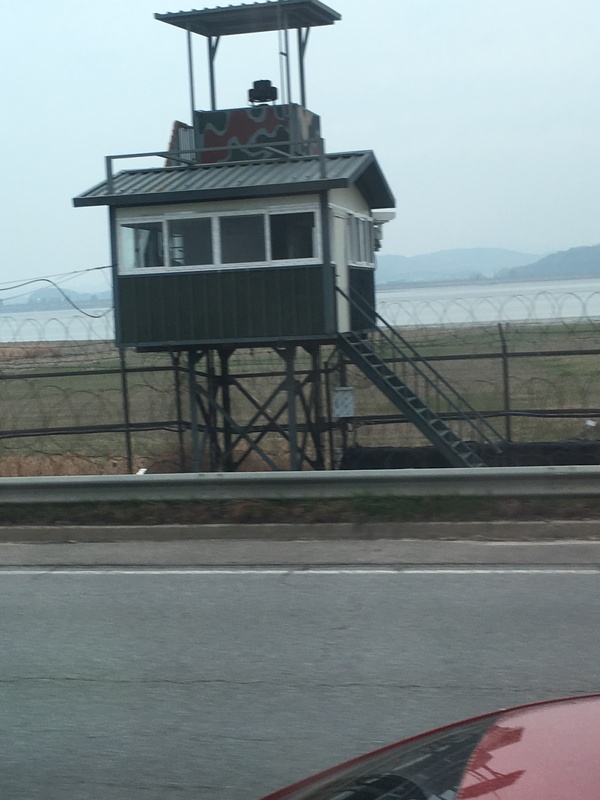 The bus drives along the road next to the Hahn river that is a boundary between North and South Korea…and it is well fortified with lots of barbed wire and guard huts. 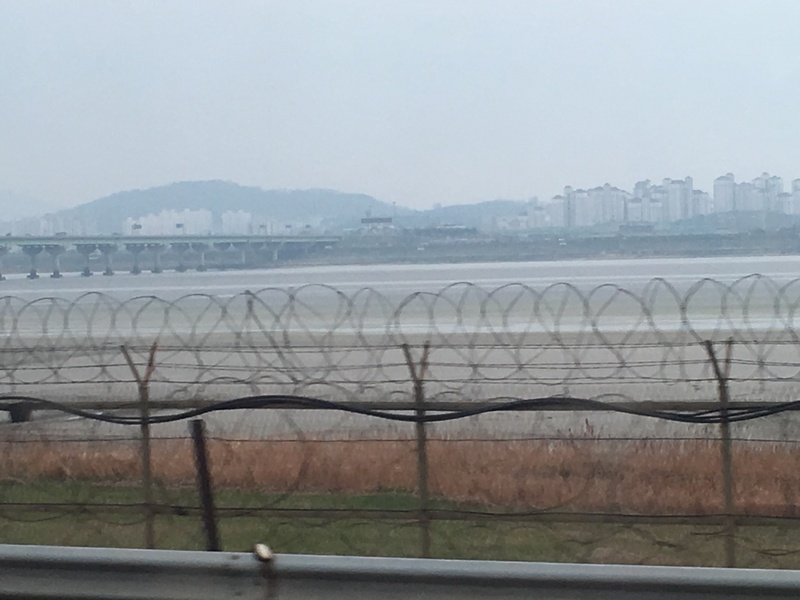 The far side of the river is North Korea. It’s amazing what you take pictures of when you are whizzing by on the highway. I don’t even think I saw the above marker until I looked at my pictures. I just aimed out the window and kept clicking. All in all, it was a great day. I’m glad I didn’t get hung up on the “military” aspect of the tour, because it was much more interesting and fun than I thought it would be.